At Champion System all we need from you is an idea or a concept and we can then take those ideas and turn it into reality for you. Your ideas can be conveyed by a sketch drawing, pictures, photos – any way you can get your design concept across to us – we will then create design proofs based on that input and go from there. At Champion System, we understand it’s important to get the right design. That’s why we don’t charge for changes – you can have as many designs and as many changes as you need to get your design right. Our customers send us all types of logos and artwork to use in custom design. Unfortunately, not all formats will print on your apparel well. Why do we need these types of files? These files are referred to as Vector format files. 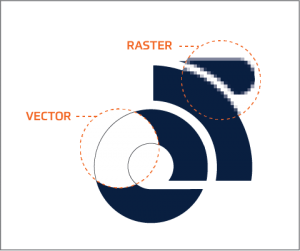 Vector files can be resized and manipulated, to whatever size we need, without making them look blurry when printed. Still have artwork and design questions? Check out our frequently asked questions about artwork and design, or contact us and we’ll be happy to help. When you look at colors on a screen, they can change based off of what screen you’re using. To make sure the color printed is your color, Champion System uses the industry standard: Pantone Matching System. Every color on your design will be matched to a Pantone, so be sure to take a look at the Pantone Color System to choose your colors. Please note, our color chart online is a rough way to choose colors, because, again, the shade and tone may vary depending on the screen. To be absolutely sure, a Pantone Color Formula Book is recommended and can be found in most art and print stores.